Mad-Lit is a Languages and Travel Agency from Buenos Aries, Argentina. It is owned and run by the delightful, Mariel Dagna. Mariel has been visiting SGI for her groups to study English in London for over 20 years. Mariel and Mad-Lit are SGI's oldest and most-valued partners and we always look forward to January every year, when we welcome a new Mad-Lit group for a 3-week English course. The Argentine group always has super enthusiastic, positive and smiling students and they are a real pleasure to teach. They always represent their country extremely well. Mariel always takes her group to a 'stop-off' famous destination city before they arrive in London. In 2015, Mad-Lit students visited Barcelona and this year it was Istanbul before landing in London. 12 students (girls and boys aged 16 to 17) were all around the B2/C1 level and the teachers reported that they were a very lively, pleasant and hard-working group. As you can see from the photos, the final day tradition of the students receiving their end-of-course certificates from their teachers and then loads of pizza and coca-cola went down extremely well and we hopefully look forward to a returning the next Mad-Lit group in 2017. 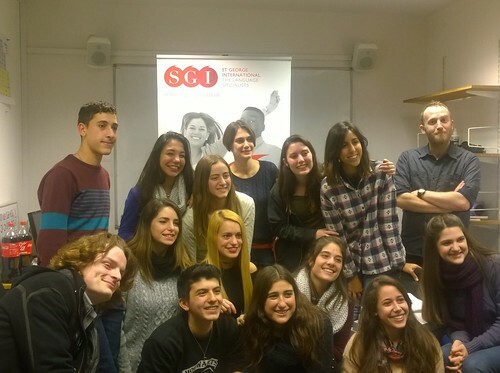 If you would like a group of students to learn English at SGI in London, we would be happy to discuss your individual requirements to create a unique English course. We can also create a special Social Programme just for your group to include the best cultural highlights of London. We look forward to getting to know you here in London.